The heirloom tomatoes at Ella Bella farm stand at the farmer's market last Saturday were so unbelievably gorgeous that I decided to make a tomato tart for a picnic last Saturday in Golden Gate Park. The recipe came from 125 recettes de La Régalade by Yves Camdeborde. I have wanted to make this tart since I got the book. How could you resist a tart dough comprising of equal amount parmigiano cheese, butter, and flour? I mean, that's such an irresistible indulgence. I made two versions in one day, as I wanted to test this brand new recipe. I used pastry flour for the first version, and pretty much followed the recipe exactly. The resulting product was not ideal. The tart dough was a little loose, probably due to not enough gluten from the pastry flour. It was also ever so slightly soggy, probably because I didn't let the tomato rest long enough. For the second one, I used regular all purpose flour, blind-baked the tart (about 10 minutes), and roasted the tomato slices for 10 minutes at 300F. Then the tart was reassembled, and in it went to the oven for another 10 minutes. It was a little bit of a challenge getting the soft roasted tomato slices to go neatly on top of the tart, but I managed. The resulting tart was better than the first one, the dough wasn't as loose, and the bottom of the tart was only a teeny bit wet—but that could have largely been due to the change in the type of flour.. I'm not sure if the difference was worth the pain however. So I ended up with a recipe that was pretty much the same as the one I started out with. I'm in a melancholy mood today. I was on the computer tonight, reading an email that Dan had forwarded to me, an article on the NY Times about Julia Child. The TV had been left on after watching the BBC nightly news, suddenly a hoarse, high-pitched voice came booming out of it. It was unmistakably Julia, I was drawn to the TV. She was there, in a bright purple shirt with her ever present apron and a tea towel tucked into her waist band, towering over her dear friend Jacques Pepin, beaming admiringly at him hacking away at a hapless chicken. I've been far too busy with my life, I was sad when I heard she had passed away, but not too much, as I knew she'd had a full and wonderful life--one which any of us would be lucky to live. I have not taken the time to mourn her properly. Tonight, here I am, at home alone, eating a simple meal of cheese, saucisson sec and bread, crying salty tears for my friend, my teacher, my inspiration. Bon voyage Julia. Faites de beaux rêves. My contribution to the latest Is My Blog Burning v.7: You're Just the Cutest Little Dumpling is not mine at all, but a recipe by Chez Pim's first guest chef, David Kinch, of the lovely Manresa restaurant in Los Gatos. I must admit that I almost missed this IMBB, but for Amy who reminded me when I ran into her yesterday that the deadline was today, and not next Sunday as my absent-minded self had been thinking! I had a vague idea that I would ask David Kinch for the recipe for his delicious Crab Beggar's Purse. But of course, in my usual form, I hadn't quite managed to do it yet. I decided to drop him an email to ask anyway, not having much hope that he would even check his email on a weekend. Luckily, the sweetest David replied to the email with a detailed recipe in record time. So, here it is, Crab Beggar's Purses à la David Kinch. For those of you checking Chez Pim for a Mina blurb, I promise I will write it up very very soon. Living and blogging are not quite in harmony at the moment. But for now, here's another amusing snippet from an IM conversation, this time with Yishay, also in London. pim: hey i knew about the orange thing before you did—what kind of jew are you, huh? yishay: and wear a sweater - its getting cold. pim: yes mum, but, um...what exactly is a mezuza? pim: I guess I am disqualified now? pim: oh well, i'll go back to being a recovering buddhist, thanks much. --Pim, off now to grab a drink at Zuni and then to check out the late night menu at Frisson--you see why I just can't keep up on the blog? I am a sick, sick puppy. My apology for confusing the future of chef Grant Achatz's new restaurant Alinea with the new incarnation of Trio. In my last review of Trio, I was expressing my disenchantment with Grant Achatz leaving the avant-garde cuisine in favor of bistro-ish food. Happily I was so very wrong, Alinea will continue in the innovative trajectory of chef Achatz's cooking at Trio. Trio itself, on the other hand, has gone through a complete conceptual transformation into what is now called Trio Atelier. I just found this article announcing the opening of the new Trio Atelier (thanks Lizzie for pointing this out). Apparently the owner of Trio was so inspired by Robuchon's L'Atelier de Joël Robuchon that he has decided to turn Trio into one. I ran into my friend Shuna last week at the Ferry Plaza and found out that she would be cooking and giving away free food at the new Stonehouse Olive Oil shop on 24th st. in Noe Valley this coming Saturday. I thought I'd let you know here, since I know Shuna's cooking would be yummy (she used to be pastry chef at Citizen Cake you know) and I know we all like free food, yes? Especially since in this case the free food will be a show case of California artisanal best, including Stonehouse Olive Oil and my favorite new find, The Fatted Calf charcuterie. A little side note on the Fatted Calf: I had been complaining for years that I could never find good saucisson sec, french dry sausage, in this country. Even the better salumi houses, like Mastrelli's in North Beach and the Ferry building, don't make properly dried sausages like those in Europe. Until one lucky day a few weeks ago, after lunch at Chez Papa, I wandered down the street into a little gourmet goodies shop and found some seriously good looking charcuterie by the Fatted Calf. One bite into the bone-dry and intensely flavorful saucisson sec got me swooning and magically transported back to Europe again. No more sneaking anything pass the sniffing dogs at the airport—and no more sweaters smelling like a dead pig—bravo the Fatted Calf. Back on the free food topic, Shuna said they would start serving at lunch time and continue to do so until they run out of food, so I suggest you go early and have your fill before all the goodies are gone. how hard is hollandaise when you're drunk? No time to write anything particularly interesting on the blog, so here's a snippet of my IM conversation with my dear Max in London. Max: how hard is hollandaise when you're drunk? My life is taking over my blogging life again. Work is more than hectic, and so is my social life. Next week I will have two consecutive house guests, one from New York and the other from London! But I really had to take time from my crazy schedule to write about the fun event last night. (I will also take a bit more time soon to write a response to the sizzling discussion in the comment section of my blog on Trio.) Anyhow, first about last night, a bunch of us San Francisco food bloggers got together at Heidi's lovely place in the Height. The idea got started in my correspondence with Amy (of Cooking with Amy), who kindly took the initiative to make it happen. Left to my own devices, it would have been 2006 before I managed to organize one!. It was a great deal of fun to make new friends and have faces to match the blogs now. As Derrick (Obsession with Food) put it, it definitely gives a new perspective when reading a blog. The only person I knew before through some work connection was Alder of Vinography. It was really interesting how much everyone was so much like their blog. I suppose that we spend so much time writing and tending to the blogs that our personalities just couldn't help but come through in spades. How very interesting? I am sorry this post is, yet again, not about food. 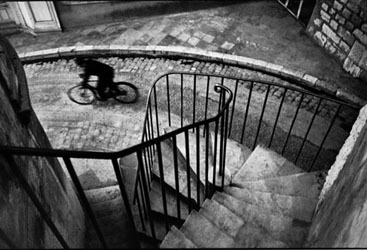 I am very sad to hear that Henri Cartier-Bresson passed away today at the age of 95 at his home in Montjustin, Provence. His legendary work was famous for capturing le moment décisif: the decisive, elusive moment when everything comes together perfectly. His black and white photographs are not only beautiful but captivating, engaging, almost to the point of demanding participation from the part of the viewer. There is much to learn from his art, his person, his point of view. The most important of which, perhaps, is that there is a decisive moment in every moment, one only needs to look to be able to see it. "S'oublier, oublier l'appareil, être vivant, regarder."